This house is settled at the original residence of one of Indonesian Heroins, Cut Nyak Dien. The current building is the replica of the real house, because the original one had been burned down by the Dutch in 1896. This historical site is located at Jalan Cut Nyak Dien, Lampisang villages, Peukan Bada district, Aceh Besar. This was the place for Cut Nyak Dien seatled and made strategy for war. Again in 2004, when Tsunami blasts Aceh, this house made as shelter for the refuges. The one that keeps the original from this house is the well. The well is made high, where the lip of the well reaches the second floor. High lip of the well is made with the aim that no enemy (the Netherlands) could put any poison in the well. This house was built by the Dutch when Teuku Umar pretending to surrender to the Dutch (in case of war strategy) so that the Dutch then provide all the facilities, both weapons and building homes for shelter. At that time, the Acehnese people considering Teuku Umar as a traitor for cooperating with the Dutch. Once the facility was complete and sufficient Teuku Umar gathered his people distributing weapons and attack the Dutch. In 1981 this home was rebuild by Depdibud and inaugurated by the Minister of Education and Culture Fuad Hasan on 4 February 1987. 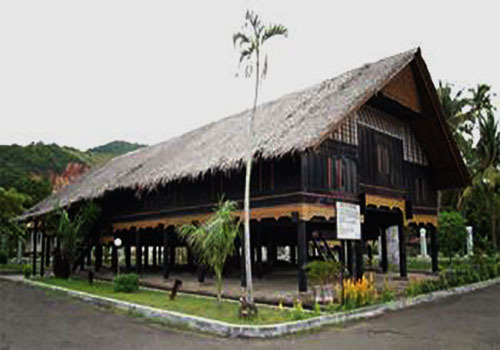 This house measuring 25 x 17 meters, the construction of the wooden building has 65 pillars, where in the Acehnese language called Tameh, and it dominated by black paint. This heritage house is always looks clean and tidy, and it always maintained well by the officers. Cut Nyak Dien House is open daily from 8.00 am to 5.00 pm, where the visitors reached an average of 1000 to 12000 people per month.